Encased in a heavy-duty cold-roller electroplated steel housing, this new 2U rack computer supports eight 3.5-inch open hot swappable storage drives and two 2.5-inch internal drive bays. The RMC6224A also features 4 low profile PCIe backplane, single Xeon E3 Quad Core processor and an embedded Micro ATX motherboard. Acnodes announces its release of it all new RMC6224A. 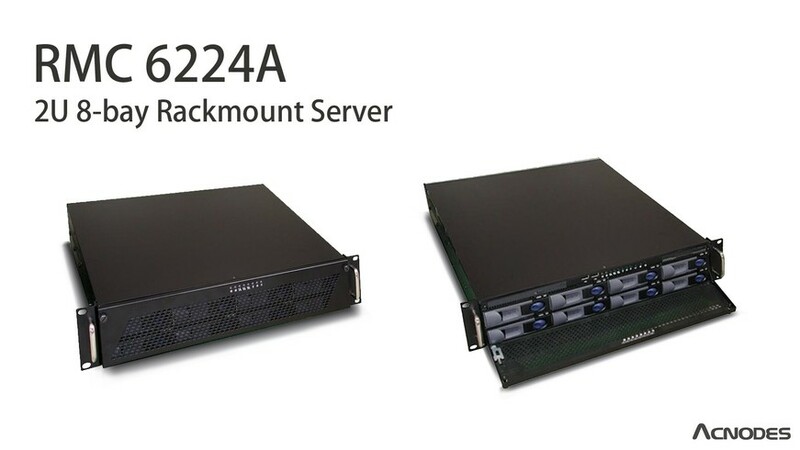 This 2U rackmount computer is an ideal platform for data-intensive and high-performance computing applications that require significant local data storage capacity. The RMC6224A 2U rackmount computer comes with eight 3.5-inch front access/hot swap storage drives bays and also features two internal 2.5-inch hot swappable HDD bays for OS and applications, is perfect for high-end data gathering, data storage, video processing and graphics in government and defense, industrial automation, and many other applications. Our new 2U high rackmount computer is made of heavy-duty cold-roller electroplated steel for long-term durability. Its front door with two thumbscrews allows the unit to be locked for system security. There are two USB 2.0 ports power and reset switches the front giving you easy access. Moreover, the Power, LAN and Hard Drive LED indicators located in the front panel let you know the status of the unit at a quick glance. The RMC6224, utilizes an Intel® Xeon E3 Quad Core processor with Intel® C224 chipset on an industrial Micro ATX motherboard and features a built-in riser card with four low profile PCIe slots for expansion. This 2U industrial computer system supports four high bandwidth dual-channel DDR3 1600/1333 MHz DIMM up to 32GB memory, and features six high speed SATA HDDs with RAID 0/1/5/10 function to provide data redundancy and increase fault tolerance. Furthermore, it comes with a full set of I/O connectivity from the standard form factor Micro ATX motherboard including two Gigabit Ethernet ports, four high speed USB ports, and video. Our product line configurations are illustrated on our web site at Acnodes.com. However, most of the rackmount and industrial monitors are custom built to customers’ exact requirements. Contact us via e-mail: info@acnodes.com or telephone (1-909-597-7588) for more information.